Book News: Mary Ingalls May Not Have Gone Blind From Scarlet Fever : The Two-Way Also: Scandal-mongering author Kitty Kelley turns her gaze on women in Congress; Goodreads makes some unexpected new rules; and Mark Athitakis explains why Barnes & Noble brought literary culture to the suburbs. Mary Ingalls, the sister of Laura Ingalls Wilder, went blind from illness at age 14. 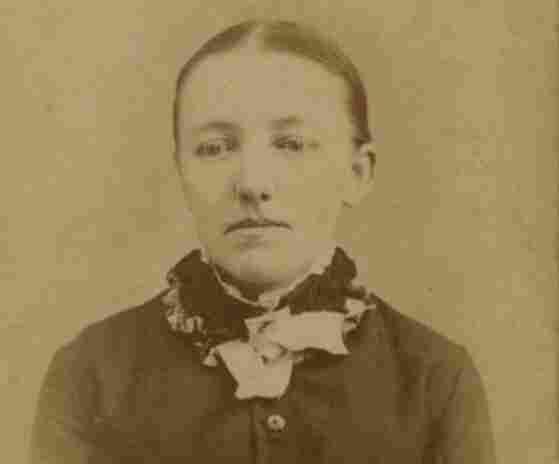 -- Mary Ingalls, the older sister of Laura Ingalls Wilder and a central character in her Little House series, famously went blind — supposedly from scarlet fever. But a study (paywall protected) published Monday in the journal Pediatrics suggests it was actually due to viral meningoencephalitis, and that Ingalls Wilder changed it to scarlet fever to make it easier to understand. -- There's a lovely and cryptic new short story from NW author and Orange Prize winner Zadie Smith in The New Yorker. -- Kitty Kelley, the notorious celebrity biographer who Joe Klein once called a "professional sensationalist," has a deal with Grand Central Publishing for a book about women in Congress. Kelley is responsible for, among other rumors, the story about Nancy Reagan's supposed affair with Frank Sinatra. Women of Congress, watch your backs. -- "Its stores were designed to keep people parked for a while, for children's story time, for coffee klatches, for sitting around and browsing. That was a business decision — more time spent in the store, more money spent when you left it — but it had a cultural effect. It brought literary culture to pockets of the country that lacked them." — The New Republic's Mark Athitakis on why Barnes & Noble helped to democratize literary culture. -- Bookish.com, a fascinating experiment in digital book recommendations funded by Simon & Schuster, Penguin and Hachette, launched Monday night.